Conservation for the future of sharks in danger. He surfaces from the deep, his black shadow resembling a creature in the night. His fin skims the surface. The lifeguard blows his whistle and with that everybody is out of the water: SHARK! Jaws has done nothing to aid the reputation of the mysterious shark, leaving many to ask the question, “Why should we protect sharks if they are so scary?” Ever since Steven Spielberg created a 25 foot killer shark almost 40 years ago sharks have since been depicted as man-eaters. That is our greatest misconception. Did you know more people die every year from vending machine accidents or lightning than they do of shark attacks? Sharks may have a bad reputation, but they are an integral part of our marine ecosystem. 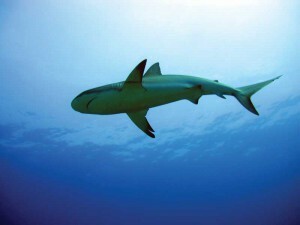 The TCI is home to Caribbean Reef Sharks. Sharks are often apex predators, meaning they are at the top of the food chain with few natural predators. Healthy and biologically diverse shark populations are important to maintain balance in marine ecosystems. Sharks regulate fish abundance by feeding on fish below them in the food chain. Sharks can have a varied diet, which keeps the reef healthy by promoting biodiversity. Sharks control the ocean ecosystem as top-down predators; if sharks disappear there are no predators to eat the carnivorous fish, like snapper, that in turn eat the herbivorous fish, such as damselfish. The herbivores consume and manage the amount of algae on a reef—if there is too much algae, it starts to overtake the reef and suffocate the living coral. In a nutshell, fewer sharks means fewer herbivorous fish, more algae, and less coral. Dying reefs do not attract high-end tourists, nor do they protect beaches from the ravages of storm waves. Fortunately, the Turks & Caicos Islands are home to many shark species, including: Great Hammerhead (Sphyrna mokarran), Caribbean Reef Shark (Carcharhinus perezi), Nurse Shark (Ginglymostoma cirratum), Tiger Shark (Galeocerdo cuvier), and Lemon shark (Negaprion brevirostris). This is why there is such beautiful coral reefs surrounding the Islands. We have open water sharks that travel thousands of miles and resident sharks that patrol their territory on the reef, all contributing to a healthy ecosystem and economy. You may ask, “If there are so many sharks in TCI’s waters, why should we care about shark conservation?” Keeping the marine environment balanced and healthy helps the community, economy, and tourism. Protecting the marine environment helps to keep the Turks & Caicos Islands a premium eco-tourism destination. Tourism here is dominated by people who come for white sand beaches and pristine snorkeling/diving conditions. If the reefs die, tourism will surely follow. Where else on Earth can you kayak with baby Lemon Sharks, snorkel with a Nurse Shark, or dive with Caribbean Reef Sharks? Sharks are some of the oldest creatures on this planet with species dating back more than 400 million years! You would think they are invincible, as they outlived dinosaurs and are still one of the top predators in the ocean. However, shark populations are in global decline due to an increase in demand for shark products and as unwanted by-catch in commercial fisheries. Scientists estimate that approximately 100 million sharks are killed every year. Most shark species are extremely vulnerable to overfishing. They are often mistakenly managed like fish, rather than the mammals (such as dolphins and whales) that their life histories much more closely resemble. Sharks are slow to grow, mature late, and produce fewer offspring than other fish species. Nearly 30% of known shark species fully assessed by scientists are threatened with extinction and another 26% close to becoming threatened in the near future. Their decline is not sustainable, and before we know it we will no longer get to experience these exhilarating and humbling animals in our waters and will be left with the consequences. Now is the time to act before damage to the delicate marine ecosystem is irreversible. You can help: Educate yourself about the threats our oceans are facing; be careful what you eat; avoid buying shark products; help keep our oceans clean; go diving or snorkeling with sharks! Support shark conservation by posting or tweeting your favorite picture of a shark, a craft project or poster to #tcisharks. Have you met Shark Stanley? This happy hammerhead shark is the face of an outreach and awareness campaign to support global shark conservation efforts. This campaign is dedicated to creating permanent shark protection and supporting proper management of shark and ray species worldwide. Maybe you’ve read his book, and have been introduced to his friends Manta Reigna or Pierre the Porbeagle. This sociable guy is trying to get the word out that “Healthy reefs need sharks.” He will gladly swim to your festival, event, or business to promote his cause. Also check out www.sharkdefenders.com or www.pewtrusts.org/en/projects/global-shark-conservation for more information. Maintaining healthy shark populations in our waters is an insurance policy which will help us maintain TCI’s ecological and economic resilience. Permanent shark protection is needed. And, it would add prestige to the TCI brand, as one of only 10 countries that have stepped up for sharks. Both the Bahamas and the British Virgin Islands have recognized their vital role and implemented permanent protection. Real shark conservation and preservation will only add to our “Beautiful by Nature” Turk & Caicos Islands.